Digital access, commerce, communication, literacy and etiquette… What do these words have in common? Well, for starters, they are all components of digital citizenship. In fact, these concepts—and many more—are part of an online code of ethics students need to know about in order to develop and maintain a positive digital footprint and online presence. As with any other type of education, we—as educators—can’t make assumptions that students have the necessary knowledge to make good decisions when surfing the web. And even if they do—they’re kids, so yeah, they constantly need to be reminded of what’s cool and what’s not. With the wide variety of resources available for teachers, there’s no reason we shouldn’t be promoting the importance of behaving safely and responsibly in the digital world. 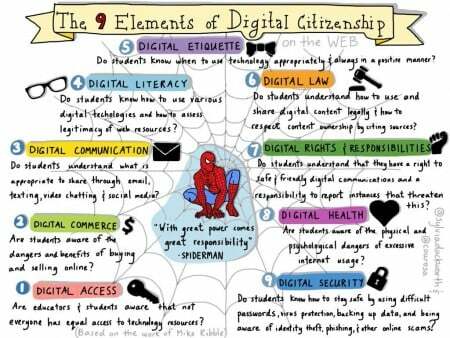 Speaking of resources, check out the nifty infographic shown below, one that can be used to address various aspects of digital citizenship. Props to Sylvia Duckworth for creating and sharing this very useful visual. Click here to view a full screen version of this sketch note. Use the infographic to teach students about how to be safe and respectful when utilizing digital networks and social media sites so they can create a positive online identity—one they can be proud of now and in the future. 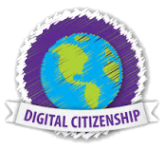 For more info about digital citizenship, check out the Teacher’s Guide to Digital Citizenship, a recently published article on Edudemic written by By Kristen Hicks.